Rachael Wiseman’s book on Elizabeth Anscombe’s Intention has been recently published by Routledge in their Philosophy Guidebook series. “This book is clearly, beautifully and thoroughly organized. The content is exciting and offers a thoughtful and compelling reading of Anscombe’s Intention” – Candace Vogler, University of Chicago, USA. 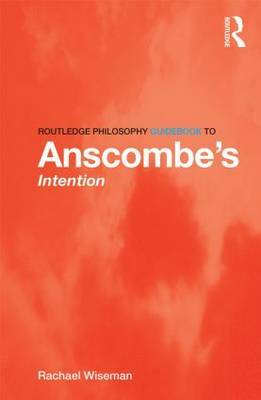 “This superb guidebook is an essential companion for anyone trying to understand Anscombe’s brilliant but somewhat elusive book. It enables the reader to see the unity of what can seem a rather disparate work, in ways that students and professional philosophers alike will find eye opening” – Adrian Haddock, University of Stirling, UK.